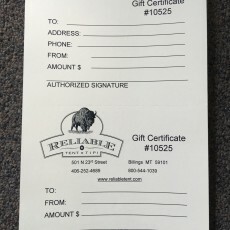 Buy your Reliable Tent and Tipi Gift Certificate here!! A Reliable Tent and Tipi Gift Certificate is a great present for anyone especially that person that is hard to buy for. They can be purchased in any amount and used on any Reliable Tent and Tipi product. What a great way to help that someone special buy a canvas wall tent or tipi. Free Shipping for the Gift Certificate!! !